The North is becoming ripe with new discoveries and economic activity. Our business services are equipped to handle any unique need of our business guests. 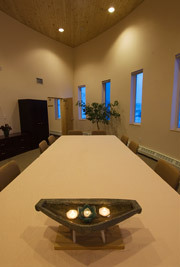 We offer two meeting rooms: one can accommodate up to 16 attendees, another up to 24 seated banquet style. We provide office and equipment support including photocopier, fax, conference speakerphones and flat screen TVs. We also offer a full range of options in our dining room, from meals for individual guests to large group catering for any gathering. We can arrange vehicle rentals and heavy equipment rentals for contractors. We can also quote special long term rates for rooms and meals based on number of man nights for a project.